The influx of homeless pets into animal shelters and rescues is a heartbreaking, never ending process. Far too many lost, abandoned, or surrendered dogs, cats, and other pets end up in shelters every day. The Humane Society estimates that 7.6 million companion animals enter animal shelters every year. Not every homeless dog or cat ends up in a shelter or rescue that will keep them until a home can be found, no matter how long it takes. The most unlucky pets end up in animal shelters where the clock never stops ticking. They are running out of time. 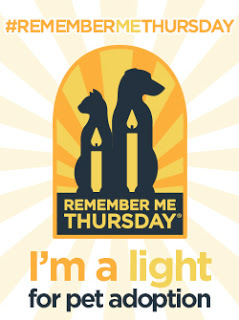 Put this Remember Me Thursday badge on your blog! I adopted Phoebe from the county animal shelter I was volunteering at. She had arrived with a male companion, dirty, matted and frightened to death. Not long after she and the little boy dog arrived at the adoption center, he began having problems with his neuter surgery. They had to send him back to the clinic which was miles away. Now Phoebe was all alone in her kennel. It took some time for her to respond to me when I walked by her cage. There was something special about her, I can't explain it. She looked so sad and defeated. She wouldn't get out of her bed or even lift up her head. Each time I passed by her kennel I would speak softly to her and pet her gently on the head. After several hours and rounds up and down the aisle she finally began to respond to me. Eventually she got out of her bed, wagged her tail and approached the kennel door to greet me. I was so relieved she was finally responding to something, to someone. I wasn't looking to add another dog to our family, but I just couldn't leave Phoebe there. She was so frightened and fragile. I knew she needed to get out of the shelter right away, so I brought her home and, well the rest is history! Read more of Phoebe's story here. On REMEMBER ME THURSDAY we shine a light on pet adoption. Phoebe became an important member of our family! People often ask Why can't we save them all? It's a question with no clear answer. My question isn't just Why can't we save them all, but Why do so many pets end up without homes in the first place? What is the root cause of this problem? and far more importantly, What can we do about it? Those are the questions that plague my mind and rack my brain. There is no one clear answer to any of them. 1. Grab the Remember Me Thursday badge (above) and place it anywhere in your post. 2. Publish your post on or by Thursday, September 27, 2018 and add the Remember Me Thursday blog hop at the bottom. Get the Code below to add the hop to your blog post. 3. Then visit the blog hop hosts, Lola The Rescue Cat and Three Chatty Cat's as well as other blogs in the hop! Just click on each blog icon below and together we'll shine a light on homeless pets. THIS IS THE REMEMBER ME THURSDAY 2018 BLOG HOP!! Phoebe is what can happen when a dog is adopted into a wonderful loving home. She is a beauty and so friendly. Thank you for sharing her story on #RememberMeThursday. Thank you so much for sharing Phoebe's story and hopping along with us on Remember Me Thursday. We appreciate your support! And I agree... we need to get at the root cause of the problem. We need politicians on board with this. 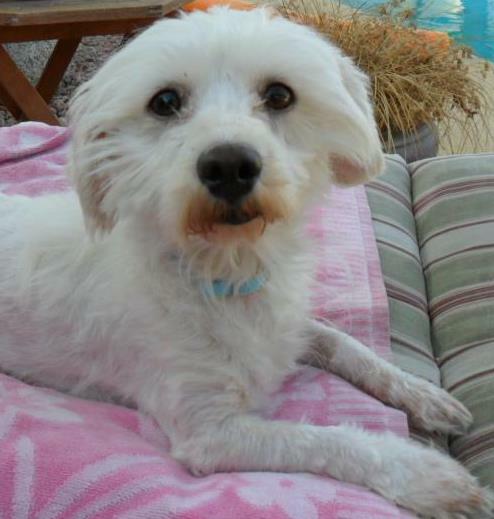 We love the "after" photo of Phoebe. Makes these feline hearts warm to see see her go from shelter inmate to beautiful doggie diva! Phoebe is adorable. I'm so happy she found such an amazing home. I wish all the homeless animals out there could be as lucky. This is such an important subject which I did blog about also as I think the more we do on a daily basis also the more animals we can save. Thank you for sharing Phoebes story she is one lucky little girl. They absolutely do. They didn't ask to come into this world; we brought them in. They are our responsibility. I wonder too about why so many pets end up with no homes. From a data point of view, it makes sense to me that as the human population grows, so too would the pet population, which means problems and opportunities for people and pets will increase as well. My fear is that common sense and common courtesy are not as common among the humans anymore and that's affecting us and the pet population. Hopefully, events like #RememberMeThursday, blog posts like this one featuring rescue success stories, and better education all around, will help us tackle the myriad of issues we face for people, for pets, and for the planet. Snuggles to Phoebe and Icy! Phoebe is THE most wonderful girl. I wold never have recognised the confident pup I saw as a frightened rescue dog. A tribute to your loving care! A lovely post. Well done! Aww I never knew the backstory about Phoebe! What a great RemembermeThursday tribute and informational post. I've never bought a pet in a store and always have brought in pets off the street or taken in those not wanted. I wouldn't do it any other way. I totally agree with your question about why should we need shelters and rescues at all? It's so discouraging when people won't take responsibility for the creature they've brought into their lives. I just don't understand how people can dismiss their furry companions so easily. I'm so happy that Phoebe ended up with you and in her perfect forever home! The question you pose is definitely a hard one to answer. Thank you for writing about Remember Me Thursday and for hopping along with us! Such a great post, Cathy! I loved hearing about Phoebe's story. She's a lucky girl to have you for family! I'm Pinning this to share, and I really believe our combined voices can help these homeless furbabies. Maybe one day, they will all have a home and be able to answer the question by saying, "Yes, we saved them all!" I am so happy you rescued Phoebe! She's such a sweetheart and so sorry she had a rough start in life. I never knew she came in with another dog! I'm so glad that you took the time to bring Phoebe out of her shell and then got to take her home. I hope her companion was adopted as well. My dog Theo was at the shelter for a month, and the volunteers told us that not a single person was interested in him. Both my kids only wanted him, they barely looked at the other dogs, and didn't even want a puppy at another shelter either. I do believe in fate when it comes to pet adoption.